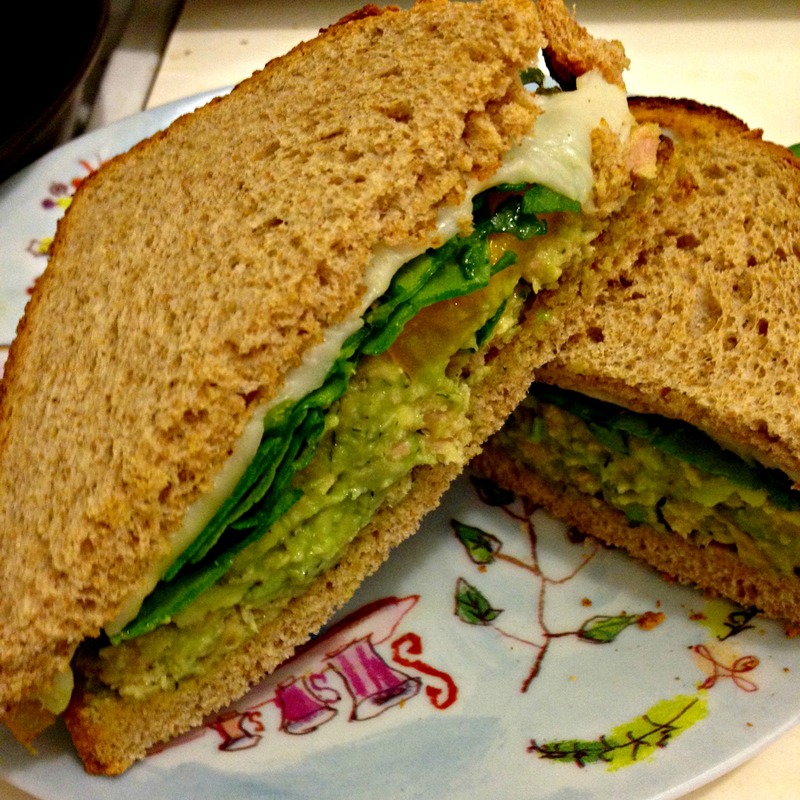 Instead of using mayo in my tuna, I’ve started using avocado instead and it’s awesome. I mash up the avocado with just a tiny bit of olive oil until it’s creamy then mix it with the tuna, a little bit of salt, pepper and garlic and a lot of dill. For lunch today I toasted some whole wheat bread, slathered on the tuna, a slice of swiss, sliced yellow tomatoes and spinach and it was crazy delish. Back when I had a personal blog I always did something to mark September 11th. Now of course I have a food blog and so I thought I just wouldn’t post today, but then I started thinking about what I love most about this country and this amazing city that I get to call home. Without a doubt, one of the things that I love most about this country and most especially about New York City is our spirit of resilience. Eleven years ago our hearts didn’t just break, they shredded, but we’re still here. We mourn the loss of lives and we never forget, but we forge on. Eleven years later Americans still feel the grief, but in that time we’ve also laughed and loved. There have been breakups and makeups and weddings and babies. We’ve cheered and danced and sulked and cried. New jobs, trips abroad, sillyness and seriousness; they’ve all gone on in the past eleven years. Of course we’ve had some great eats too. Life goes on. It has to. On sports radio they talk about sports and on food blogs we talk about food. With that in mind and with faith that my readers are smart enough to know that I am not trying to make light of the sanctity of this day, I present to you one of my favorite New York stories. If you ask most New Yorkers what love most about this city the answer is almost always, “The people.” Diversity is something we almost take for granted here because it’s not just that we have so much of it, it’s that we see it all day every day all around us and we celebrate it, especially when it comes to food. Every non-Jew in this city has an opionion on the best deli and orders their bagel with a “shmear.” We expect our pastas to have only the best “mozzarel” and “rigut” and fragrant Halal carts which are all over the city are considered to be a treasure for giving New Yorkers access to a quick delicious and affordable lunch. Two years ago, on Halloween day, I was running an errand. As I passed the kosher deli on my block I took notice of an African American women waiting outside because she had with her a stroller in which the most adorable toddler was dressed as a pea. Basically the baby was zipped in to a green pod with two large “peas” stuck to her and her face sticking out as the top pea. I thought that would be my big dose of cuteness for the day, but there was more. That my friends, is a New York story. I love this city. I love this country. Never forget. 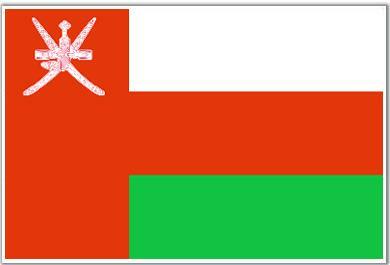 O is for… Oman. Oh Man! Fun fact: Oman is the only country in the world that starts with the letter “O.” That means that I only had one choice in what country to use for my letter “O” recipe, but surprisingly there are a number of Omani recipes online (seriously how much do we love that whole internet thing!). So finding Omani recipes wasn’t hard at all, instead the challenges were this. First, as I’ve said many times, Middle Eastern food is a challenge for me because they use so many of the things that I’m allergic to. Second, Middle Eastern food is Middle Eastern food. Food from that area of the world is really delicious, I love the spices and the emphasis on fresh vegetables, but the food tends to not be country specific so you often find the same dishes in Armenia that you would in Yemen. This recipe is an amalgamation of 3 recipes that you’ll find if you Google, “Omani Kofta,” so that’s Omani enough for me. Form in to sausage shaped patties, approximately 2-3 inches long and an inch in diameter. This should yield about 12 kofta. refrigerate for 30 minutes to an hour. Heat some olive oil in a saute pan and, working in batches if necessary, cook kofta for 10 minutes, flipping each halfway through or until meat is fully cooked. Heat oil in large pot. Add zucchini and cook over medium high heat until zucchini begins to soften; about 5 minutes. Add garlic and cook 3 more minutes. Stir in tomatoes, salt and pepper, chilis, vinegar and bay leaves. Turn heat down and allow to simmer uncovered for 10 minutes. After 10 minutes stir in the parsley and mint and cook for one more minute. 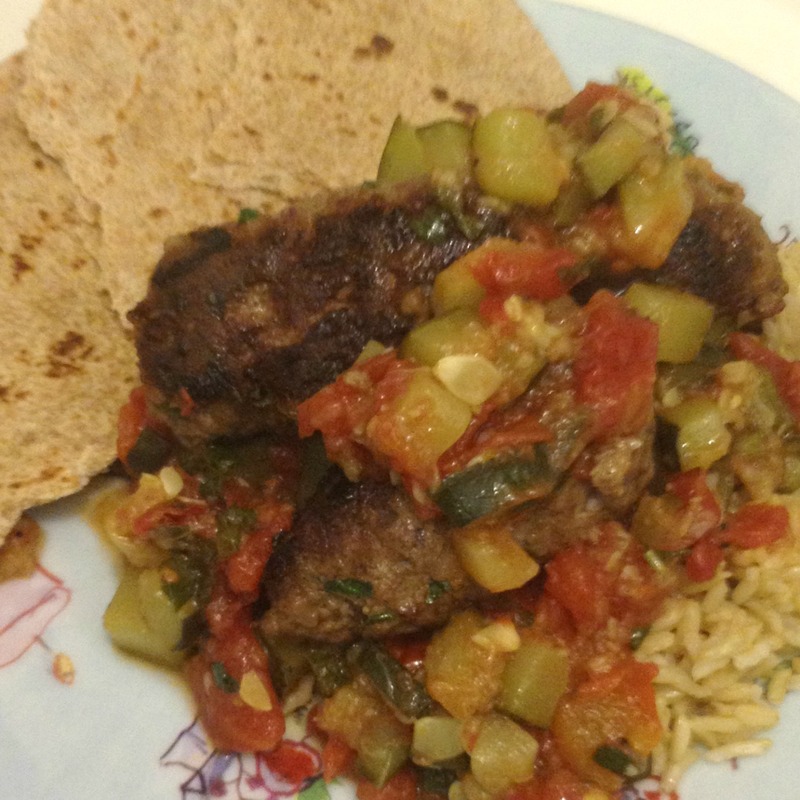 Serve kofta and zucchini sauce over rice with warm Middle Eastern flat bread on the side. What a great recipe! I love the spices and especially love how the aroma of those spices wafted off the dish. The mint in the sauce added a great punch of bright freshness to the sauce. I’d change some very minor things next time which I’m sure would launch this recipe from A- to A. Next time I make this I’ll add a bit more of the herbs to the sauce. Also, I was surprised that the recipes I found called for balsamic vinegar, though Oman is a pretty international place so balsamic has probably become as ubiquitous there as it is here, I think this would’ve been better with red wine vinegar or something with a bit more bite since the tomatoes are already sweet. Speaking of the tomatoes I’d planned to use fresh since it’s the perfect time of year for that, but I forgot to buy extra at the farmer’s market. I ran to the organic section of my local market only to find that ALL of their tomatoes were imported from California or Mexico. Really!? At this time of year, in this area of the country we have more amazing local tomatoes than we know what to do with and this local loving gal could not in good conscience buy the tomatoes that were shipped in from afar so canned it was and it worked out great! The sauce itself was so good and could definitely be used on a number of other things.